After teasing us on #LiveatFive with the possibility of a turn on RuPaul’s Drag Race, Broadway.com favorite Alexis Michelle is confirmed to compete on the ninth season of Logo’s acclaimed reality competition. Michelle promises to serve “body, curve, swerve, glamour, class, a little touch of prostitute, and of course this mug” on the show, but we fully expect to see some nods to the Great White Way as well. After all, she’s a Broadway baby through and through. She idolizes Bernadette Peters and Alice Ripley; she just played a sold-out show at Feinstein’s/54 Below (and will return next month); she even painted mugs (out of drag as Alex Michaels) for Broadway.com's Gotta Dance! series with photographer Matthew Murphy. 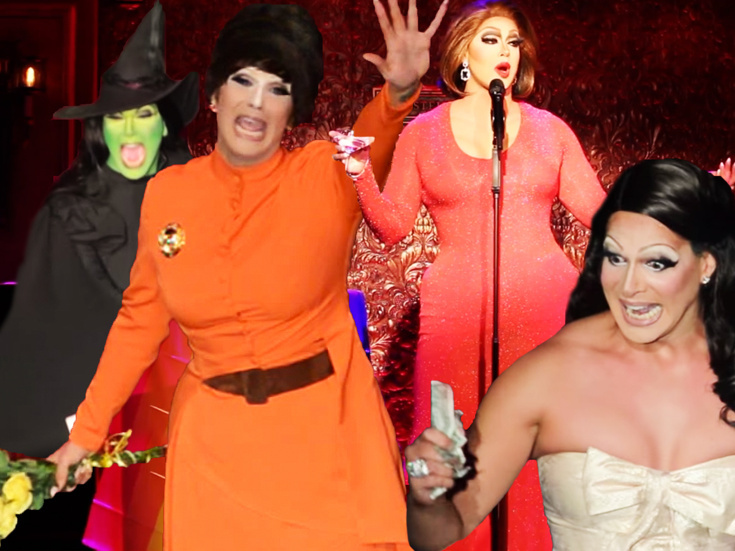 Take a look at just some of our favorite Broadway-infused performances from Alexis Michelle below. Break a leg, girl, and don’t f**k it up! Here’s a tip: if you’re going to perform “Defying Gravity” as a drag queen, you better damn well fly. While competing in New York’s So You Think You Can Drag, Alexis took to the rafters of New World Stages to dare gays to look to the Western sky (you know, toward Hell’s Kitchen). But wait a minute—that’s not Idina Menzel. Is that…is that a recording of Lindsay Mendez?! Kudos. Not only can Alexis slay a lip sync, but she can also provide live vocals. Watch her deliver the Witch’s rap from Into the Woods, and then launch into a stunning costume change that elicited a cacophony of “YAAAAS”s. William Ivey Long, eat your heart out. For more of Alexis’ vocal stylings, check out her take on “The Ladies Who Lunch” at Feinstein’s/54 Below. How often do you see a drag queen tackle Sondheim with equal parts zing and nuance? We’ll drink to that. Queens impersonating Barbra is a long-celebrated facet of drag and queer culture, including Jim Bailey performing as Ms. Streisand at the Superbowl Halftime show in 1978. Alexis gives her own interpretation in a one-two punch, serving both Yentl and Funny Girl realness in one megamix performance. And you better believe she had a tugboat. As you can gather from the aforementioned tugboat, costumes change and levitation, Alexis is a queen who relishes an attention to detail. For instance, when she sang Little Shop of Horrors’ “Somewhere That’s Green” in West Hollywood, she went for a full Audrey look, complete with a black eye and cast. No one ever said drag wasn’t painful.